The Royal Shakespeare Company's (RSC) latest play is so sensual that you can actually smell the sand and fresh flowing water set in the ancient exotic land. With an innovative set, Dido, Queen of Carthage proves to be quite an impressionable experience. Performed in the RSC's Swan Theatre in Stratford upon Avon until October 28, Dido, Queen of Carthage was Christopher Marlowe's first play. It is a distinctive piece of work, flashing between the Greek gods on Mount Olympus and the love affair between Dido and refugee soldier Aeneas, who has washed up on her shores with his crew fleeing the devastation of his homeland, Troy. As Trojan hero Aeneas is Venus' son, the goddess has a vested interest and is watching over him, but his life seems controlled by the arguments and whims of the gods. His passionate love affair with Dido is told through the queen's emotions, and she is dizzy as a lovesick teenager after being struck by Cupid's arrow (or injection in this case ). Her obsession with him means Aeneas' departure can only lead to a tragic conclusion. 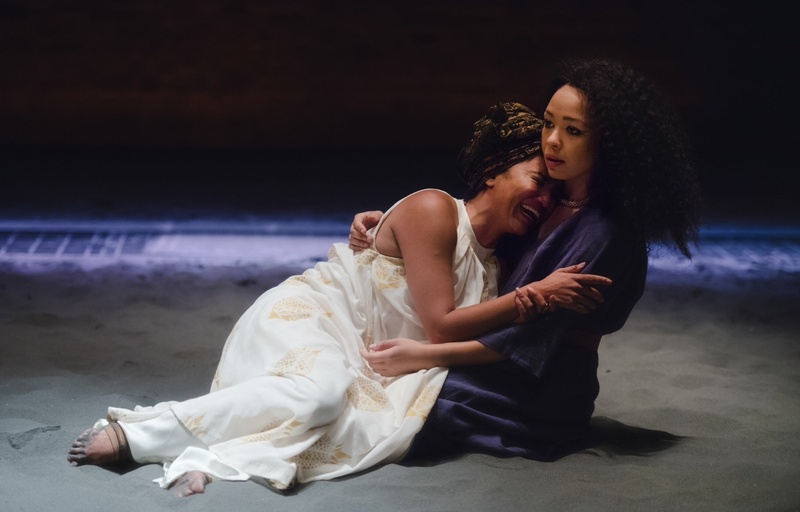 This is Dido's play and her emotions are nearly always the main focus, which are beautifully acted out by actress Chipo Chung (making her RSC debut). 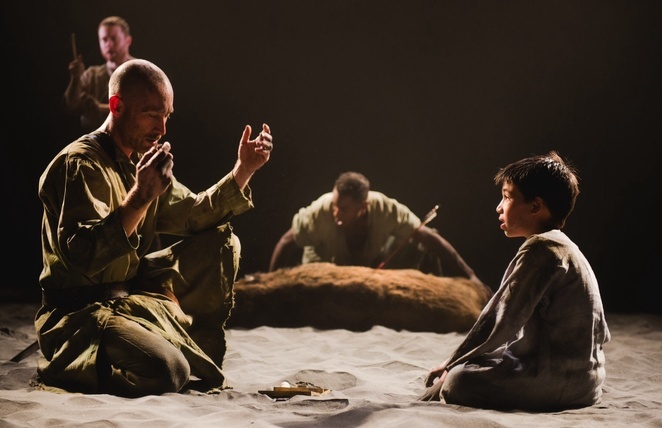 Sandy Grierson is Aeneas, pictured here with his son. The best thing about this play, however, is the stage. It's a huge sand pit that totally brings the North African region of Carthage and Mount Olympus world of the gods to life as the cast frolick and toy with the sand. Dido writhes in it sensually when most emotional while Venus picks handfuls up and lets it fall through her hands when summoning images of her son Aeneus through a cascading screen of water. It's a striking, clever and beautifully visualised effect. There's many more lovely innovative touches by director Kimberley Sykes including the portrayal of the gods as hung up on family, betrayal and jealousy as mere humans. They are shown to be as dysfunctional a family as the Kardashians in the introductory scene, which starts to make sense as the play goes on. Hermes is a sneaker-wearing trendy with gelled hair slicked back like two wings, while Venus is a suitably seductive lady in red. She is played well by Ellie Beaven, who many will remember for her outstanding performances in A Mad World My Masters and more recently seen in Vice Versa this season. As Venus, she has a drip in one arm that Cupid seeps blood from to inject people with whenever he needs them to fall in love. It's a lovely fresh take on Cupid's arrow. Meanwhile, Cupid is played by dwarf actor Ben Goffe, who balances well the comedy in his role. The characterisations in this latest production are excellent and what makes it stand out from the crowd. Beyond the leading pair, Dido's rejected admirer Iarbus evokes plenty of emotion as a besotted spurned lover. Daniel York playing him is excellent. 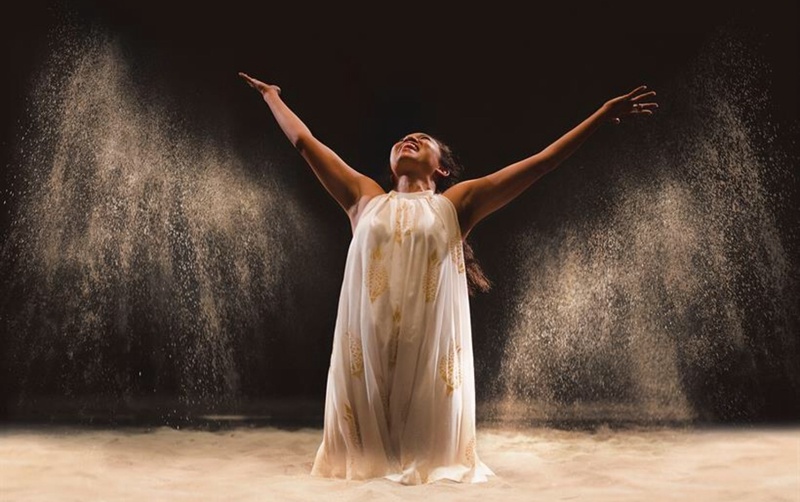 While actress Amber James playing Dido's sister Anna is quite a presence on stage who draws attention. I was surprised to find this was her RSC debut season. Chipo Chung as Dido crying in the arms of her sister Anna, played by impressive Amber James. There's so so much to excite in this production - from the innovative set to the emotive performances and ideas, and the ultimate tragic finale. It's not often that I see a play where I think 'I've never seen that before', but this production did that for me on many levels. All of it feels fresh and exciting.